Engineering wizard Ian Richardson wants to find ways to replace fossil fuels with hydrogen. He wants to design and build bigger rockets to take people farther than we’ve ever gone before. And he wants to travel in space. Both of Richardson’s parents indulged his enthusiasm and creativity. They played along with his fantasies, and let him explore and experiment. “I was always raiding my mom’s cooking cabinets and mixing things together – anything I could get my hands on. My mom was okay with it, but I had to clean things up, especially when the volcanoes got too big,” he laughs. Richardson’s dad, Mark, is a mechanical engineer who works on aircraft carriers at the Puget Sound Naval Shipyard in Bremerton, Wash. His grandfather, Vic Buchanan, is a retired Boeing mechanic. When he was in junior high school, Richardson learned that his grandfather had done design work for the wing of the first stealth bomber. That knowledge moved him to study aeronautics as a hobby. Aircraft and rocket design remain popular subjects during annual family hunting trips. In high school, Richardson was a wrestler, a snowboarder, and a superlative student who excelled in math and science. He often stayed after class to question his teachers and pick up extra subject matter. One physics experiment particularly ignited his passion for design. Teams of students were challenged to build catapults in order to propel water balloons toward their teacher, who stood some distance away in an open field. Nothing epitomizes Richardson’s big personality, or his family’s sense of fun, more than their shared love of fireworks. What began as prosaic Fourth of July family backyard fireworks rituals are now elaborate, community events. The escalation started when Ian and his brother were hired to work for a family friend in his fireworks business. Armed with an ever-increasing arsenal of mortars, fountains, and aerials, Richardson wondered, “What if we light two at a time – or three – or four?” He began to choreograph elaborate displays for ever-increasing gatherings of onlookers. One year, a firework tipped over and shot off toward the crowd. The next year, platforms were built and installed on the Richardson’s roof. Ian Richardson loves being a Coug. 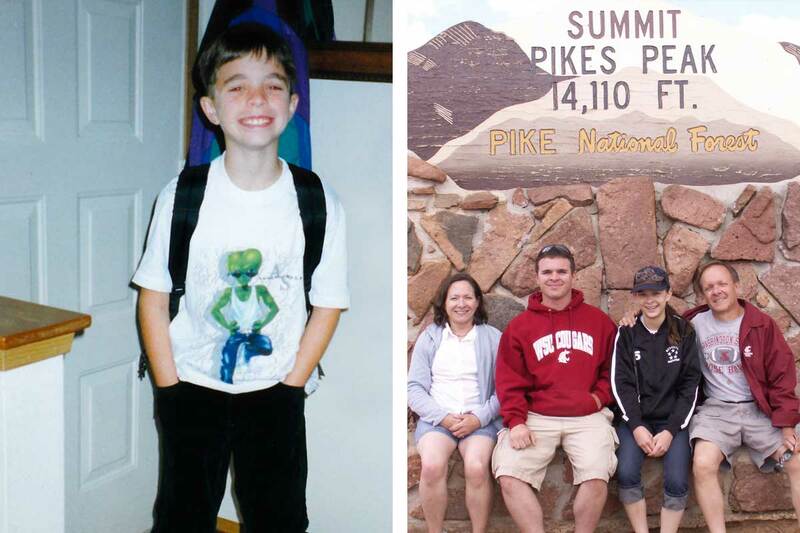 His dad graduated from WSU, and their family followed WSU football throughout his childhood. When he arrived in Pullman in 2007 as a freshman, Richardson felt completely at ease and at home. The Cougar spirit really hit home during his first experience, as a freshman, at a home football game. He remembers mingling with the crowd and being extremely impressed by the camaraderie. One of Richardson’s favorite undergrad projects was a team assignment to build a solar-heated box. The goal of the project was to heat the box outdoors in December. His team struggled to make their lukewarm experiment function more effectively. He chuckles at the memory. Before his senior year, casting around for post-graduate ideas, Richardson reached out to a brand new WSU professor, Jacob Leachman. It was a relationship that would re-launch Richardson’s dreams about space. 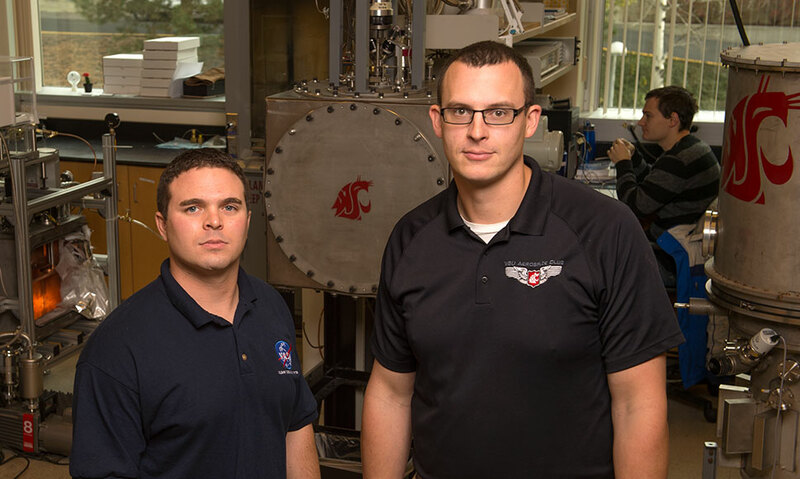 “Hearing from a student before I even made it to Pullman; that’s a professor’s dream come true,” says Jacob Leachman, head of WSU’s Hydrogen Properties for Energy Research (HYPER) Lab. Leachman was still at the University of Wisconsin in Madison when he began correspondence with the energetic undergrad. “I had been hired to implement a cryogenics lab at WSU in order to further cold hydrogen research. There was a big national niche that needed to be filled, and some misconceptions to overcome. Five years later, we are breaking through. Ian is a big part of that,” Leachman says. Leachman hired Richardson to help set up his lab. They have been working together ever since. As WSU’s cryogenics lab was coming together, space industry scientists were seeking associates to help test assumptions about how liquid hydrogen interacts with helium. Rocket fuel tanks are pressurized with helium. Scientists assumed some helium is absorbed back into hydrogen fuel during flight, but needed more data in order to predict fuel and engine performance. Better predictive models were required, especially with unprecedented deep space trips being planned and new, powerful, large-scale rockets going into production. As a senior, Richardson undertook an in-depth study of one of hydrogen’s isotopes: deuterium, or heavy hydrogen. It required many hours poring over data, assembling variables, and computing. During his research, Richardson conducted an internship at the National Institute of Standards and Technology (NIST) where he worked with the world-renowned equation of state (EOS) expert, Eric Lemmon, and learned the fine points of measuring thermodynamic properties. In early 2012, HYPER Lab received funds from the Joint Center for Aerospace Technology Innovation (JCATI) to measure the densities of hydrogen-based, cryogenic fuels. Leachman tapped his student for the work. Richardson, now on track to receive a Ph.D .in material science and engineering, was in heaven. “This assignment meant everything to me,” he says. “Everything I did before suddenly made sense.” He was able to employ an in-depth knowledge of thermodynamic property measurement while finally pursuing his passion for building and design. Richardson’s new doctoral research design scheme included high-pressure plumbing, cryogenic refrigeration, and vacuum systems, all in the service of the space industry. The core device for Richardson’s density measurements was an older, unused magnetic suspension balance. The instrument, designed to measure the density of liquids, wasn’t built for cryogenics, so it had to be repaired and then retrofitted. The magnetic suspension balance, or densimeter, includes a mechanism reminiscent of claw arcade games – the ones where players attempt to grasp and retrieve prizes. Within an internal case is a quartz crystal with a small hook at the top, connected to a permanent magnet. Above that case is an electronic magnet that picks up the permanent magnet and quartz, and allows the machine operator to lower the quartz into the liquid being measured. Now modified and refrigerated, WSU’s HYPER Lab magnetic suspension balance is the only densimeter in the world that can operate at the low, low, temperatures required for cryogenic liquid density measurements. 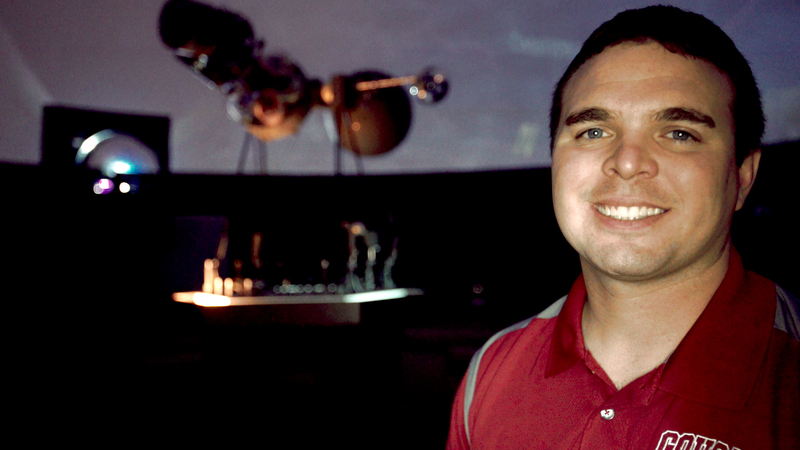 It’s safe to say Richardson was a shoo-in to become a NASA research fellow. Using his specially modified densimeter, a WSU-owned gas chromatograph, and computer generated models; Richardson has made a number of breakthroughs in the field of cold fuel research on behalf of WSU’s HYPER Lab in association with NASA’s Glenn Research Center. He collaborated with Thomas Blackham and other HYPER Lab researchers to develop a hydrogen-helium equation of state, and solved a tricky problem related to achieving accurate hydrogen-helium analysis. While hydrogen fuel cell vehicle technology has been around for decades and more and more commercial vehicles are now being rolled out, a comprehensive fueling infrastructure has yet to be built. Initial projections of an interstate, west coast “hydrogen highway” from southern California to Vancouver, B.C., fizzled after 2008, partly due to political shifts in energy priorities, and partly due to the giant price tag of current hydrogen fueling stations. An inability to construct cost-efficient fueling stations is the largest practical obstacle to the widespread adoption of an established, zero emissions automobile technology. This is precisely the sort of challenge Leachman, Richardson, and their HYPER Lab colleagues are positioned to meet. HYPER Lab’s ambitious technical readiness plan includes the design and construction of every part of the hydrogen supply chain: from gleaning and refining, to designing efficient storage units, to end-user delivery. When the 2014 International Hydrogen Student Design Contest for transportable hydrogen fueling stations was announced, Leachman asked Richardson to lead WSU’s project team. “Ian is a natural leader as well as an original, creative thinker,” says Leachman. “He’d probably be good at anything if given enough time and resources.” Richardson’s co-designer was Ph.D. student, Jake Fisher. The team also included electrical engineers, two economists, an environmental engineer, mechanical engineers, an architect, and a public policy expert. “It was awesome,” Richardson says. “It was the first time I led a large, diverse team like that.” Richardson thrived in the collaborative environment, where a broad range of ideas were explored and tinkered with. One of the distinguishing features of their design was its use of liquid over gaseous hydrogen. Traditional, gaseous hydrogen storage requires high-priced, high-maintenance compressors and large storage tanks. 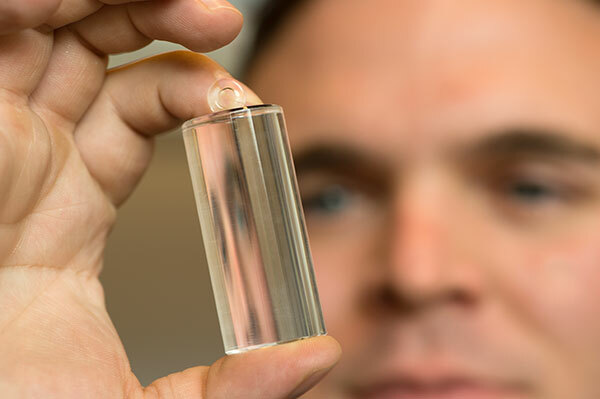 “By using the properties of the liquid itself, we can store more mass in a smaller container and we can use that liquid to help us maintain high pressure without the use of a large compressor,” Richardson explains. The design won the competition. The design and implementation plan includes everything from site analysis, to marketing, to safety costs, to product costs and projected returns on investment. The team’s proposed $423,000 unit comes to around 22% of the cost of current fuel stations and utilizes a standard, 40-foot shipping container on a removable chassis. HYPER Lab recently received funds from the National Renewable Energy Lab (NREL) to build a prototype hydrogen liquefier that will be an important addition to the design Richardson and Fisher created. In another refueling station competition bid, a HYPER Lab team is pursuing the $1 million H2 Refuel H-Prize being offered by the Department of Energy (DOE). Because HYPER Lab’s fuel station vision includes a liquefaction component, stations will function both as aggregators and as dispensers of hydrogen fuel. This source-to-user model would drastically change the hydrogen fuel landscape, thanks to Leachman, Richardson and the rest of the HYPER Lab team. In the 2030s, NASA plans to deploy a mammoth rocket to fly a submarine to Titan, one of the moons of Saturn. The Titan submarine will explore a large sea called Krakan Mare to discover its properties and phenomena. NASA scientists believe that the mission will further our understanding of the evolution of life on Earth and potential life elsewhere in the galaxy. Roughly the size of the Great Lakes, Kraken Mare, like all the seas of Titan, is comprised of liquid methane and ethane. This fall, Richardson is simulating the seas and atmosphere of Titan in order to provide NASA with data to use in their predictive models and designs. His experiments are similar to his hydrogen-helium tests, which studied the absorption of helium into hydrogen. These new tests study atmospheric absorption of nitrogen into the methane/ethane seas. Richardson has a keen intellect, seemingly boundless energy, and a deep desire to learn. He has already achieved many of his goals, and continues to dream big. “There’s all kinds of things I want to do, places I want to go. I’d like to go to Saturn, but I’ll start with the moon,” he says with a grin.